A veteran insurance investigator explains how to work as a subcontractor without being exploited, bullied, and starved out by the big national PI firms. In my previous article, I wrote about how difficult it can be to work for insurance companies and the nationwide PI firms that conduct their insurance fraud investigations. I wanted to share some of what I’ve learned (the hard way) from my years as a subcontractor/vendor and, hopefully, save you some headaches. That said, it’s important to remember that insurance fraud costs us all $80 billion a year in this country. Somebody has to investigate these cases. The illustrious Mark Gillespie of Texas told me to do work I was passionate about and make a difference. So despite some tough times for me in the SIU field, I’ve always loved the work and will always find a way to make a living doing it. Learn the terms up front. Before signing paperwork with any PI firm or management companies, ask about their payment turnaround times and terms. Make sure they know that you expect to be paid within a certain amount of time, such as upon submission of your invoice. If they tell you that their payment schedule doesn’t work that way, proceed as you see fit. Either way, at least you’ll know what to expect — before you send investigators into the field. If you are unsure about the firm, ask other PIs about them. This is a small industry. Most of us know which companies are the worst offenders, and there are many. I think I may know them all. Be ethical and professional. And if possible, be licensed. If you’re not licensed, or if you’re not licensed properly (unable to accept work through your license on your own) in that particular state, or if you have no business insurance, do not accept the case. Get the proper licensure and obtain insurance. If you live in a state like mine that has NO licensing, push for it, as I am attempting to do. Trust me: Those big firms do not want the non-licensed states to obtain PI licensure laws. Also, get a license in one or more neighboring states. Currently, I am licensed in Louisiana, Alabama and Florida. If you have something in your background that prohibits you from obtaining a PI license in most states (such as a criminal history), you need to find another profession. None of us are saints — I don’t even come close. But eventually, even in Mississippi, every state will require some sort of license for private investigators. Although I am no fan of over-regulation, states like Mississippi that have no PI regulation whatsoever are asking for trouble. Do not try to steal another company’s clients. I know it’s frustrating when you’re indirectly working for the insurance company anyway, whether they know it or not. You may be able to do it better, faster, and much cheaper. But do not try to get to them through the company you are subbing for. I tried that trick early in my career, and I was wrong to do it. Believe me: You do not want to build a client list that way. Eventually (we can only hope), the insurance companies will figure out what is going on, and you will get your shot at them. Be patient. Do not sign these companies’ subcontractor agreements without reading them carefully and including your own terms of payment. Look for their report and video submission requirements as well. You may be in for a surprise. Be clear about your payment terms. Always include your terms of payment on your invoice, and be sure to mention a late fee in your terms. If payment is overdue, send out past due notices frequently via e-mail, regular mail, fax, etc. Eventually, you may have to call and speak with accounting. You may have to send a demand letter. Remember: “The squeaky wheel usually gets the grease.” Eventually, you may need to fire late-paying clients if this becomes a persistent problem. Also, keep in mind that pestering clients may cause them to fire you. It’s a tricky balance to manage, especially if you’re just getting started and desperate for work. We’ve all been there. But you can’t let a big, impersonal company’s accounting department delay you into bankruptcy. Be polite, but be persistent. You might consider a credit line or a factoring company to help with your payroll. Most of the factoring companies I spoke with require that your company bill out at least $20,000 – $50,000 per month. Again, ask other PIs about these companies before using them. I have been dissatisfied in my talks with these organizations in the past, but honestly, I have never used them. Be careful: Do not go into debt if you can help it! Stand up for your procedures, terms and especially, your rates! Speak to other PIs if needed. Do not cave to these ridiculous requirements and fee requests from bigger companies. I understand that we all may have to bend a little, and I get that they have overhead, too. But come on! Follow the leaders and the best minds in our industry, such as Kelly Riddle, Mark Gillespie, Jim Casteel and Tim O’ Rourke, just to name a few. Join your state’s PI associations as well as other international and national PI associations. I am a member of several: the International Intelligence Network, the National Association of Licensed Investigators, the National Association of Investigative Specialists, the Association of Christian Investigators, the Council of (PI) Association Leaders, the Mississippi Professional Investigators Association, the Alabama Private Investigators Association, the Florida Association of Licensed Investigators and the Louisiana Private Investigators Association. I also read Pursuit Magazine and various private investigations blogs. Try to stay on top of the latest trends in the industry. Stick together and spread the word! The most important thing we can do is inform the insurance companies, their attorneys, and other PIs about this industry and its problems. They have to know what is really happening out here in the field. If we (the subs) refuse to accept the kinds of cases I described, the big national firms are going to have to send someone to the area in question. Sure, they often do that, but it costs them more money and cuts into their profits — which is why they try to hire you directly, if they can, at a much lower hourly rate than what a subcontractor or vendor would make. Currently, there are several large PI firms advertising for investigators in Jackson, Mississippi. Although some insurance companies may prefer to deal with a “one stop shop” (i.e., a national company or management company), many are learning that in some areas of the country, they have to turn to smaller, regional companies for some of their work. It’s happening more and more in my coverage areas. Spread the word. It appears to be working. These days, my company performs SIU/claims work directly for insurance companies or their attorneys. We also perform surveillance and legal investigations for insurance companies, individuals, and attorneys. We stay busy — and with a much better-quality clientele. Past due invoices are rarely a problem for us anymore. When payment becomes a problem, I stop working for that client. I have replaced that lost time with marketing to better clients and educating people — specifically private investigators and claims personnel at insurance companies — about our industry. Don’t get me wrong: There are some good national-level PI companies out there, companies that treat their smaller suncontractors fairly, but they are few and far between. Some of those good larger companies are particular about how they use subcontractors, which is fine with me. If you do accept subcontracting work, make them pay you a decent rate and in a timely manner. Keep in mind that the problem with many of these very large companies is that they are very large. They are machines. Turnover is high.They probably won’t fire you; more likely, they’ll simply wear you out, run you into the ground, use and abuse you until you quit. That said, I realize that we all have to start somewhere. Other PIs can suggest ethical companies that you may want to contact. As I mentioned, this word-of-mouth intel from your colleagues is why your membership in PI associations is so helpful. The bottom line: If you do accept subcontracting work, and I still do from time to time with companies that I like, make them pay you a decent rate and in a timely manner. Do not accept poor wages, bad conditions, or late payments. If you do so, you not only harm yourself and your investigators, but you harm all of us. Let’s force the industry to change together. Stay on top of your profession. Stay happy, healthy and stress-free—as much as you can, anyway. Best of luck to all of you! Richard A. Brooks has specialized in insurance fraud investigations in the Southeast for almost 15 years. In 2006, he founded Richard Brooks Investigations, a Jackson, MS firm with satellite offices near Mobile, AL and Ft. Lauderdale, FL. 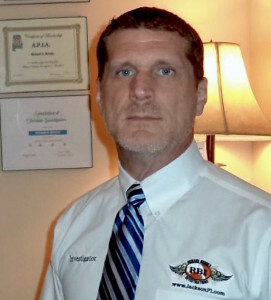 He is the immediate past president of the Mississippi Professional Investigators Association, the state director for the Mississippi Chapter of the Association of Christian Investigators, and a member of many other international, national and state PI associations. Before becoming a PI, Brooks was an active duty military and civilian law enforcement officer for approximately 10 years. He has also testified as an expert in general police procedures.